Set out an 8” x 8” baking dish. Any medium sized baking dish will do. Step 1: Start with making the fried beans. Preheat a medium skillet with the coconut oil. Once the oil is hot, add the garlic and sauté for 1 minute. Add the beans, and spices and stir. Cook on medium heat for 15 minutes, stirring occasionally. Add a splash of water if the beans are drying out. Health Tip: By adding water and not more oil, you are minimizing the fat content. Turn off heat and using a potato masher, mash the beans right in the same skillet. No point dirtying another bowl. Add the beans to the casserole dish, and evenly spread them out (this is the first layer). Step 2: Pit and peel the avocados, and place in a bowl. Add the lemon juice, and mash with a potato masher. Evenly spread out the avocado, lemon mash on top of the layer of beans. Step 3: Stir together yogurt, chopped cilantro, and taco seasoning. Add more or less seasoning depending on how spicy you like it. Evenly spread out the yogurt mixture on top of the avocado layer. Step 4: Finish the layers. Start by adding a layer of the olives, then the onions and finish with the tomatoes. Place casserole dish in the oven and bake for 20 minutes or until it starts to bubble. Serve with tortilla chips and enjoy! 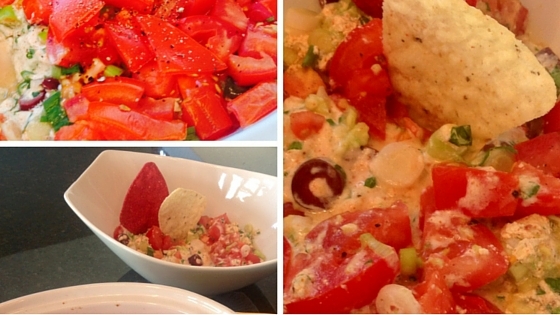 Cooking Tip: You don’t have to seed the tomatoes if you are not baking the dip. However, they do create a lot of liquid when baked. I left them with the seeds in because I don’t mind the additional liquid. If you let the dip cool before eating it, this will also help with the liquid. Health Tip: Making your own beans and taco seasoning will reduce your intake of sodium and unwanted ingredients that can be keeping you from your health goals. It takes a bit more time, but your health will thank you.